Lately I’ve been pushing our concept of bread to the limit. While I’m inching back a little bit, the idea of using different kinds of grains in bread remains something I want to explore further. Beer is called “liquid bread,” because the combination of grains and yeast is transformed into a delicious, wheat-y, amber-colored beverage. 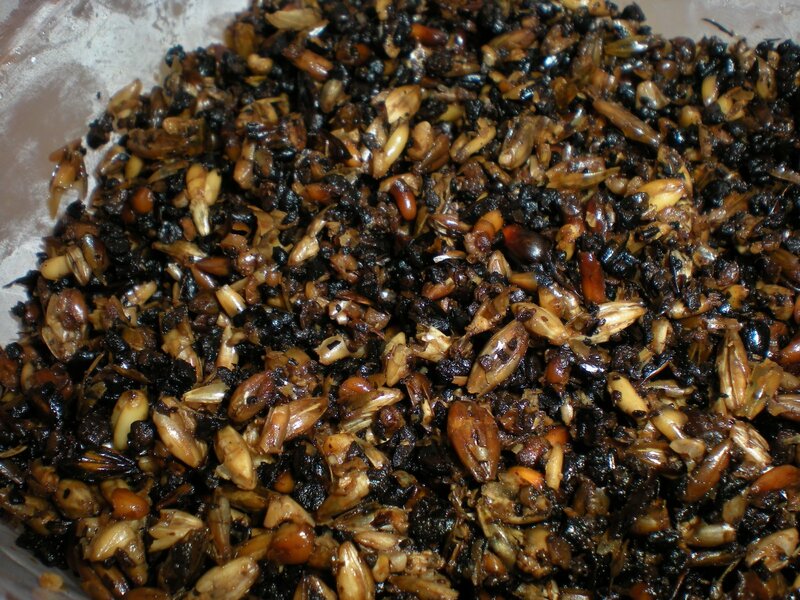 However, those grains are usually discarded after the mash stage is over. Reinhart’s Whole Grain Breads takes up where the beer brewer left off, and creates a bread with tons of flavor using these spent grains. 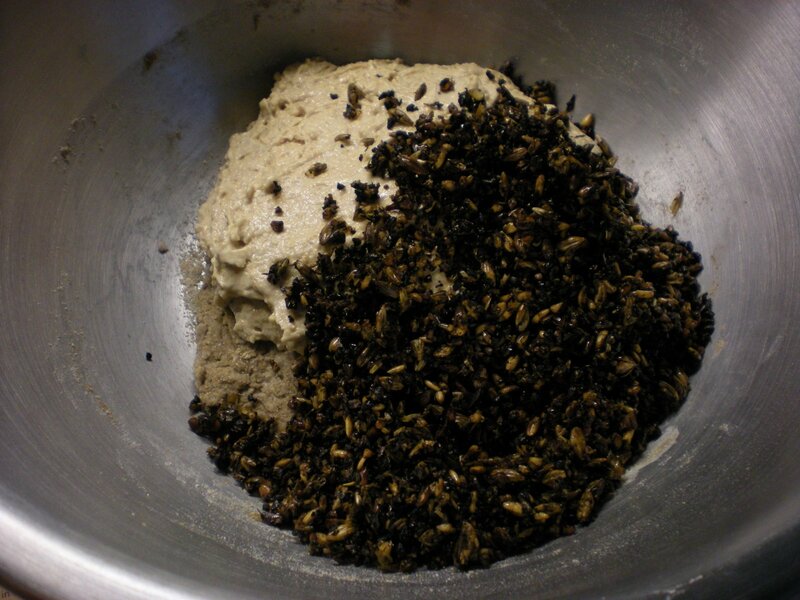 The bread begins as Reinhart’s typically do, with a biga and a soaker the day before baking. The spent grains are mixed in on the second day for the second and third risings. The biga is partly sourdough starter and partly a mixture of water and flour to get it up to the necessary weight for Reinhart’s formula. Here is where the math comes in. If I need 398g of 75% hydration biga, how do I get that if I only have 130g of 75% hydration sourdough starter? Obviously, if the biga was 100% hydration and I had 130g of 100% hydration, I could just subtract the amount of starter I have from the total I need, and then divide the left-overs and add 50% water and 50% flour. 75% hydration is trickier. You can’t just calculate it in your head. I warned you my breadbaking has gotten totally wonky. My friends, this is actually really easy. It’s a set of two formulas, the second of which you learned in the previous blog entry. The first is to calculate how much flour you’ll need. If you need 398g of biga, but you have 130g of starter, subtract 398-130 so you’re just calculating how much you NEED. You need 268g. ok.
so Flour= (268)/(1.75) = 153g of flour. Now you need to figure out how much water you need. 114+153+130=397. Ok, not 398, but pretty darn close. 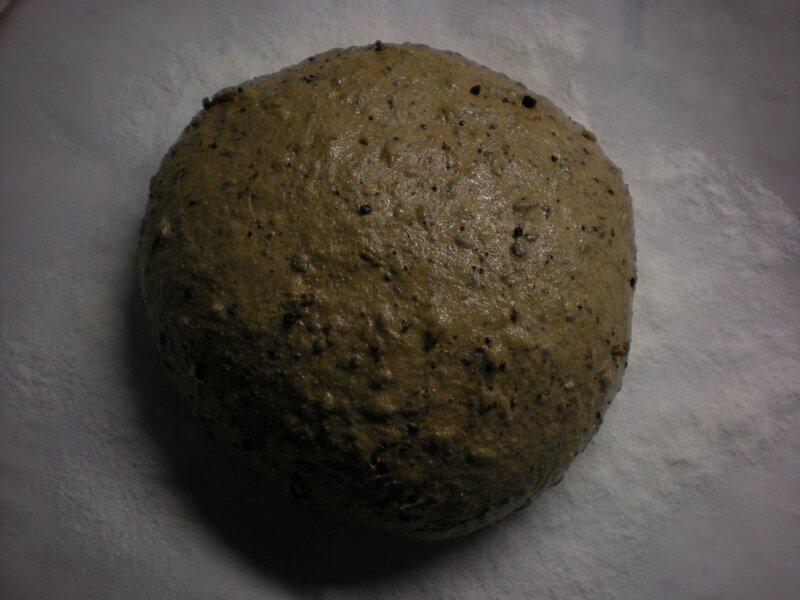 On the second day, check on your doughs. 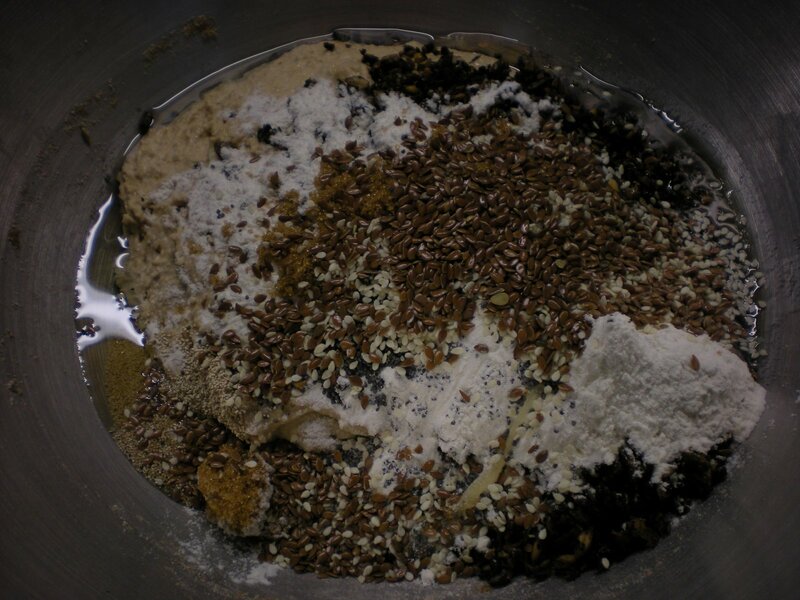 Mix them together, then add in the 113g of spent grains. That’s the weird dark stuff in this picture. Now add the rest of the ingredients for the final dough. 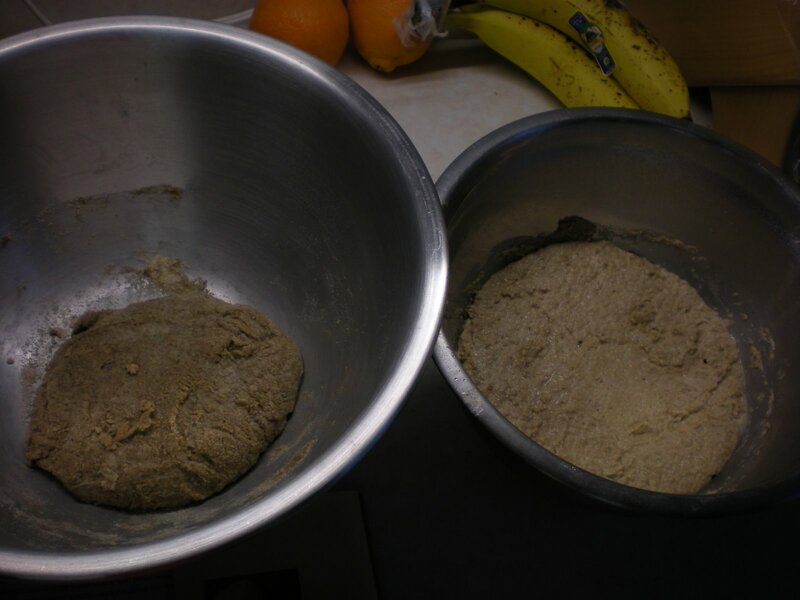 Knead everything together for a few minutes, then let rise for 60-90 minutes in an oiled bowl. 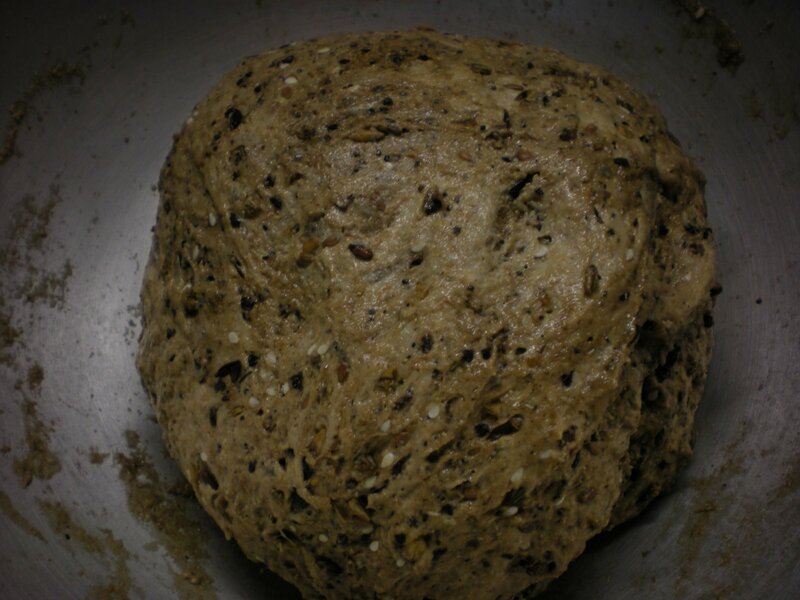 After the second rise, shape and transfer the loaf to a sheet of parchment paper lined with rice flour. Let it rise another 45 minutes or so while you preheat the oven to 450 degrees with your dutch oven inside. Once the oven is preheated, score the top of the loaf with a razor blade or sharp knife and stick in the oven. Turn the temperature down to 350 degrees. Let it bake for 25 minutes with the dutch oven lid on, then take the lid off and bake another 20 or so minutes. 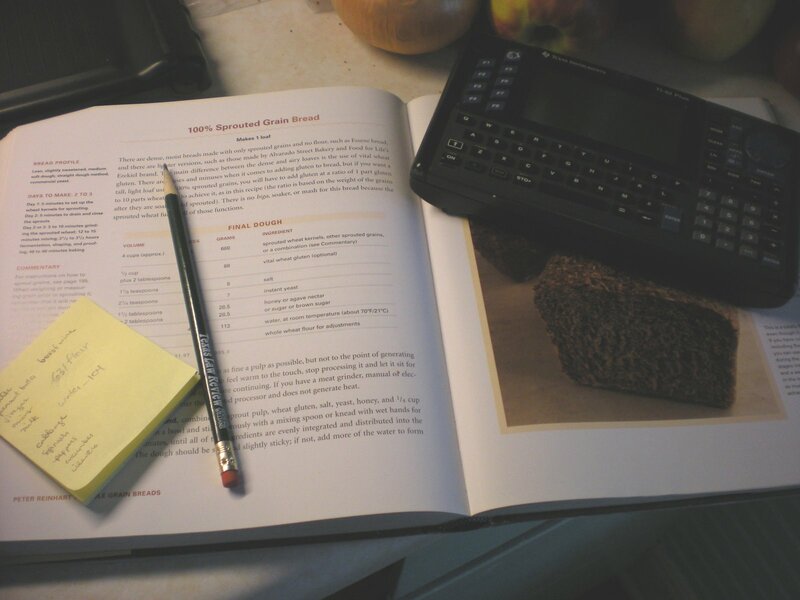 Here is your spent-grain loaf! 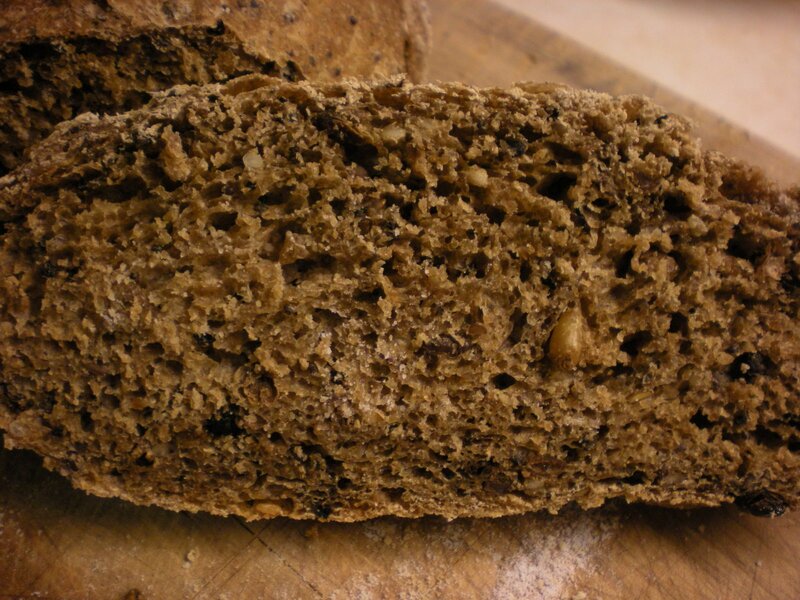 It comes out much darker than it came in because, according to Peter Reinhart, the spent grains have tons of extra enzymes and sugars that help to brown the bread and give it that nice golden color. I MADE BREAD! 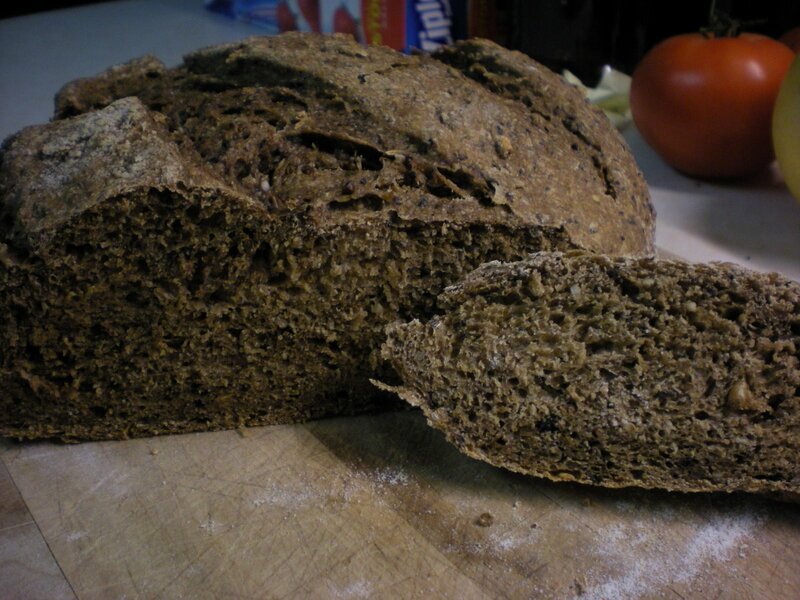 We ground spelt in a hand-grinder and baked it and it was yummy! I like. Did that bread taste as good as it looks? It looks FABULOUS!